Hot on the heals of the likes of Bosch and Black and Decker, Ryobi are a manufacturer particularly well known for their extensive range of cordless tools, both for gardening and for general DIY purposes. One of their proudest claims is that their plus ONE+ range of tools are all compatible with the same battery, the idea being that it saves you money in the long term as you gradually add to your collection of Ryobi tools. Of course this could just be seen as clever marketing or a way for Ryobi to make more sales, but there’s no denying it does save you money, provided you want to be invested in the company for a whole range of tools, but if you do, you want to be sure that the kit on offer is up to the job! 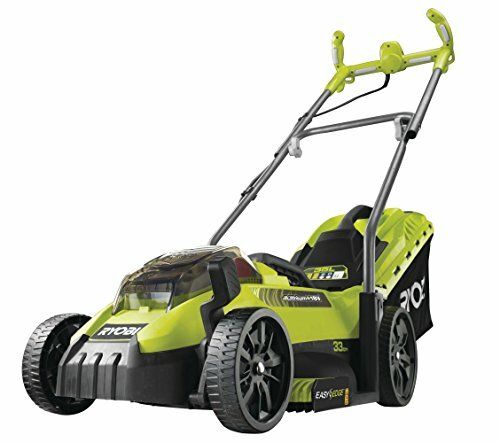 This lawn mower, for its part in the Ryobi ONE+ range does a decent job as far as cordless lawn mowers go, and the price tag is significantly lower than most, although it should be noted that’s because it’s supplied ‘sans’ battery and charger! In terms of performance the OLM1833H is comparable to other small lawn mowers such as the Bosch Rotak 32Li thanks to its 33cm cutting width, a reasonably sized 35 litre grass catcher, and just like the Bosch model it has ‘grass combs’ to aid the performance of the mower around edges and borders where grass is notoriously difficult to cut without the aid of a strimmer. What really seperates this mower from the competition is its versatility when it comes to suiting a range of users. Not only is it possible to set the handlebar to one of 5 different positions (unlike most mowers which perhaps offer one or two), but it also folds down to a remarkably small and compact size for storage, so it’s definitely one to consider if you’re tight on storage space. When fully laden with a battery this mower comes in at about 12 kg, about average for a cordless lawn mower, and the battery will allow you to cut approximately 200 square metres before needing a recharge, so it’s ideal for small to medium sized gardens, and it’s reasonable weight and cordless nature also make it one of the best walk behind mowers for use on hills and other more challenging areas. We knew even before we set out to write this Ryobi battery lawn mower review that if you were looking to save money by investing in a range of tools, then you could certainly do a lot worse than opting for the Ryobi ONE+ range. Obviously we can’t speak for other Ryobi tools we haven’t looked at, but then again in many ways their reputation speaks for itself. In any case, this lawn mower boasts many of the same great features of other market leading models, so it’s a great choice on it’s own, or as part of a range of tools.